(author biography) George Erickson is a retired dentist and has been the chairman of the Worthington, MN Airport Commission, a former president of the Nobles County Art Center, a former Vice Pres. of the Minnesota Seaplane Pilots' Association and has served on the New Brighton, Minn. Environmental Quality Comm. 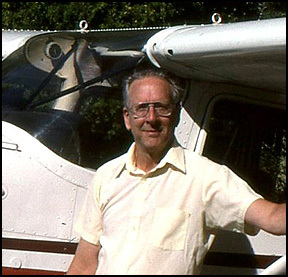 George's articles have appeared in many newspapers and general interest and aviation magazines, a few being Motorcycle Tour and Cruiser, The AOPA Pilot, Dental Survey, Mpls/St Paul Magazine, Airways Magazine, Private Pilot, the Minnesota Flyer, Northern Pilot, Cessna Flyer, the Minnesota Journal of Law and Politics, Canadian Flight and Arctic in Colour. In 2000, George was named the Author of the Year by the Minnesota Aviation Hall of Fame. He has spent parts of 38 summers exploring far northern Quebec, Nunavut, the Territories and Alaska in a variety of floatplanes and amphibians from Cubs to Cessna 206s. George's Power Point presentations on bush flying in the far North and in Australia have been featured at many major cities across the US and Canada and at aviation conventions, including the annual EAA AirVenture gathering at Oshkosh - attendance - 700,000! George and his wife of 53 years have two grown sons. He has been an Elder in a large Presbyterian church, the president of the Minnesota Humanists and a director of the American Humanist Assoc. He donates all of his book and CD profits to educational charities.